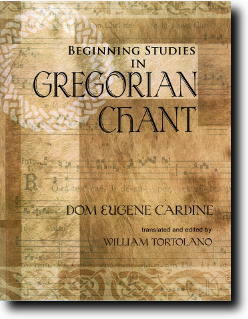 The text was originally written in French, but first published in Italian as Primo Anno di Canto Gregoriano in 1970. The French edition, PremiÚre année de Chant Grégorien was published in 1975. This translation was made from the original French with the Italian as a helpful secondary source. In fact, the Italian edition included several paragraphs incorporated by several translators that are not in the original. Most informative and helpful are numerous musical examples to illustrate every principle and advice given by Dom Cardine. In addition to the musical examples given in this text, the many references to the Liber Usualis include page numbers. Although there is some slight variation in different editions in this century, the paginations are quite close from edition to edition.